Next Monday, Raj Chetty, via satellite, will be presenting at the Oregon Leadership Summit. If the name may not be familiar, his research certainly is. Dr. Chetty, along with Nathanial Hendren and a rotating cast of coauthors have been producing groundbreaking research in recent years that focuses on economic mobility and outcomes. This is economic rock star level work. It is groundbreaking in at least two ways. First, the level of detail, breadth of topics, and findings help policymakers trying to improve outcomes. Second, the data and methodological work provide a unique and informative data set from which to analyze these outcomes. Dr. Chetty and team have matched millions of tax records over time to look at incomes, employment, incarceration, marriage and the like. They primarily compare adult outcomes for children born in the 1980s with their parents’ outcomes, and based on the location where kids were raised. They don’t have all the answers yet. But the conversation surrounding economic outcomes, and what helps or hinders progress is much further along today thanks to Drs. Chetty, Hendren, and team. What follows is a long, yet incomplete summary of this great research based on my reading of it over the years. One of their first papers (covered here on the blog in 2013) looked at economic mobility by commuting zone (groups of counties, similar to MSAs but including rural areas). If a child was born into a low-income household in a particular region, what was the probability she became a high-income household as an adult? There is tremendous variation across the country, and within states when it comes to this measure of economic mobility. 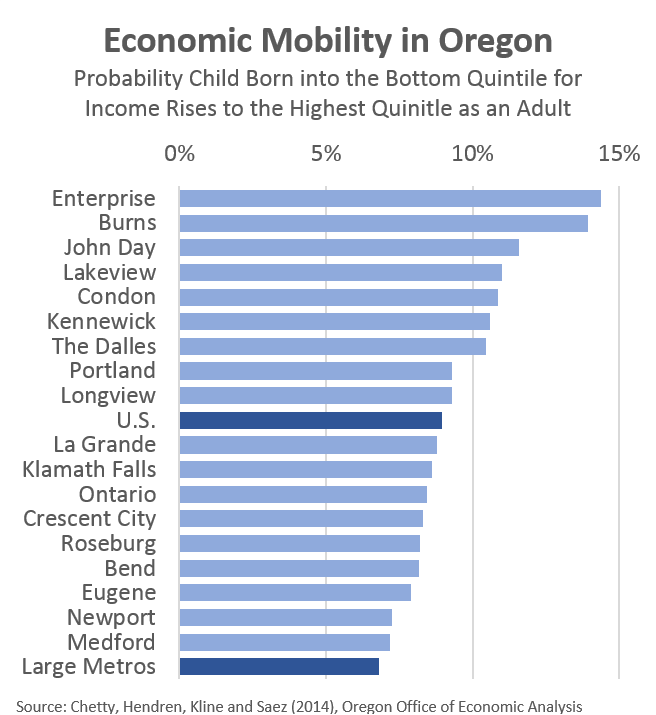 Parts of Eastern Oregon are among the best places nationwide for economic mobility. Children born there in the early 1980s grew up to have higher incomes and perform better overall than many other parts of the country. Now, these outcomes were not always reaped in their local communities. In many cases they grew up in Eastern Oregon, went off to college and moved to urban areas to find jobs as adults, but were very successful in doing so. The Portland area has pretty average economic mobility when compared to the U.S. as a whole. Some other large metros like San Jose, Salt Lake City, and Seattle measure extremely well, but for the most part, big urban areas have relatively low economic mobility, particularly in the South. Along with urban amenities (agglomeration, jobs, transit, etc) come urban problems (segregation, concentrated poverty, etc). When looking across the 88 largest metros (what I have readily available), Portland ranks 17th best for mobility. The regions of Oregon that are a bit further down on the list include many of the hardest-hit places in the Timber Belt. Given the research measures the outcomes for children born in the early 1980s, there is not a worse point in time you could start the clock for these communities. So why do we see lots of variation in economic outcomes, and economic mobility? Well, they don’t know 100% of the recipe for success, but Drs. Chetty and Hendren have found a number of key factors, or key characteristics of places with high economic mobility. These include places with less residential segregation, a larger middle class, strong families, greater social capital, and high quality public schools. The research also finds that there is an exposure effect on how a child’s neighborhood and community impact their outcomes as adults. The longer a person lives in a particular place, the more they become like the other residents. As such, if we are looking to improve mobility and outcomes, the sooner someone can move to high mobility, high outcome area, the better. These impacts apply to incomes, college attendance, marriage rates, teenage birth rates, incarceration and the like. Let’s dig into some of these characteristics a bit more. The findings show there is clearly something about the place in which a child is raised that impacts their outcomes later in life. It is not just about their own family, or own test scores, but about how it takes a village to raise a child. First, when it comes to segregation this goes for both racial segregation and income segregation. Both are a big issue in their own right. The likely channels through which this impacts children is about isolation, and reducing a child’s exposure to successful peers and role models. It’s about what kids see every day when growing up. The isolation impact is much more about low-income families and not as much about high-income isolation. As other research shows, like work from City Observatory, concentrated poverty is detrimental. Second, less inequality and a larger middle class is also correlated with higher economic mobility and better outcomes. It is not the 1%, but about broader measures across the distribution. Third, family structures are also important. The larger the share of single parents, the lower the economic mobility. Interestingly this, again, is not about a child’s own family, but about the family relationships in their community. If a child of a single parent is raised in a neighborhood with a lot of two parent households, that own child’s outcomes are better later in life even if she did not have both parents present. This impact is especially strong among black men and whether or not a father is present when growing up. The impact is less for white boys and pretty small, if not nonexistent for both black and white girls. Fourth, strong social capital — measures of social networks, community involvement, religion, local civic organization, etc — is also a characteristic of high mobility places. Fifth, high quality schools are the final characteristic associated with high mobility communities. In an interview on NPR, Dr. Chetty points out that this is the characteristic most easily impacted by public policy. He goes on to say he would do everything in his power to put the best teachers as possible in the classroom. This is supported by another paper that looks at the impact of good kindergarten teachers and how they raise lifetime earnings for their students. As the research has evolved, Drs. Chetty and Hendren have taken it to finer and finer levels of geography. In 2017 they published county level mobility and outcomes, while just last month they published census tract level mobility and outcomes. What the work shows is not only is there tremendous variation across the U.S. but also tremendous variation within cities and regions. The results hold up at all levels of geography. Neighborhoods just a couple miles apart produce wildly different outcomes when there are hardly any noticeable or visible differences on the surface. In the latest work they discuss these different outcomes for children raised in the Watts and Compton neighborhoods in Los Angeles. Closer to home we can see this variation as well. The maps below look at outcomes (incomes) for children raised in various census tracts in the City of Portland. You can look through all the different metrics for your community, or across the country in the amazing and well-done Opportunity Atlas. I want to point out not just the variations in outcomes seen between children raised in North Portland and those raised in SW Portland, but also the variation within these portions of the city. You can see big 40% income swings from one census tract to another in each part of the city. In North Portland these swings go from low to moderate income as you move from parts of Kenton to other parts of Kenton and to Arbor Lodge. In SW Portland the swings are from moderate to high income, as you move from parts of Hillsdale to other parts of Hillsdale, or from Maplewood to Hayhurst to Bridlemile. The variation is substantial. Similarly, these same types of results and variations are seen in the county level estimates. In their most recent couple of papers, Drs. Chetty and Hendren have hit on a very important finding, so-called “opportunity bargains.” These are places where outcomes and mobility are significantly better but it does not cost a family significantly more money to live there. Better outcomes are not fully captured into higher housing costs. Now, some is. In particular, housing costs are highly correlated with visible characteristics of neighborhoods. But there observable characteristics — poverty rates, per pupil school expenditures, etc — do not fully explain mobility and outcomes. There remains substantial unobservable characteristics that are not captured in local housing costs. As such, opportunity bargains exist. At the county level, there are some pairs with nearly identical results (Clatsop & Tillamook, Marion & Polk, Benton & Linn). However within regions there is also variation, which I have tried to highlight a few below. The South Coast is colored red. Curry and Coos have the same economic outcomes but Coos is more affordable and both outperform Del Norte, CA just to the south. Central Oregon is colored blue where Crook shows the best outcomes and better affordability. The major Portland area counties are colored yellow. 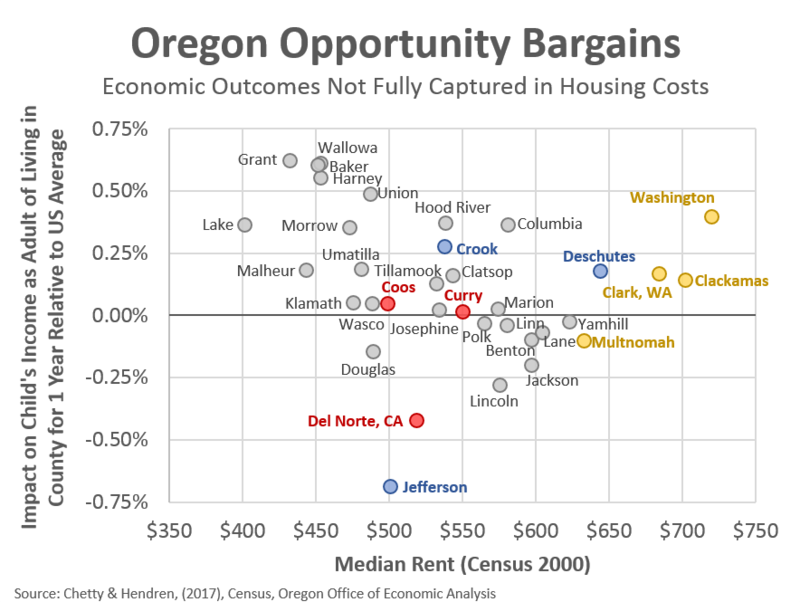 Here, Washington shows the best outcomes even as housing costs are similar to Clackamas and Clark. That said, Columbia rates very well too with even lower housing costs. Why would these opportunity bargains exist? Besides the lack of information (unobservable characteristics), the research also touches on disamenties that may make places less desirable to live, things like longer commutes and fewer urban amenties. Additionally, the research mentions the failure of households to optimize their moving decisions. For a lot of low-income families, they move under pressure — because of eviction, or a job, or health — and they seek shelter as quickly as possible, understandably so. But this decision may overlook the longer term impacts on economic mobility and outcomes for children. As such, one possible policy recommendation the authors highlight is for increased awareness and better communication of these findings and the long-term impacts on children. Targeting housing assistance or steering families toward some of these high-mobility neighborhoods is one possible way to improve outcomes. But Drs. Chetty and Hendren are well aware that simply moving people from one place to another is not a scalable solution. It does work for a given family, but obviously we cannot move all families. At some point the improvements must come from within. Gains must be seen among the permanent residents. Along these lines, the research also finds that job growth alone is not sufficient to improve outcomes. Lots of places with strong job gains also import the talent and workers to fill the openings, this can leave local residents only marginally better off. As such, the research is trying to move further into the policy arena, and to partner with other programs like mentoring services which work in local communities. It is still very much a work in progress, but Drs. Chetty and Hendren have greatly expanded the literature and findings. We now have a treasure trove of data and a solid baseline from which to measure future outcomes. I want to add three final items. First, while it is obvious from a societal perspective why we care about children’s outcomes, there are key economic motives too. These center around the downsides of lower labor supply, the loss of human capital, a permanent welfare class, and the fact that a stronger economy means stronger public revenues (or lower tax rates). Second, this awesome research clearly shows how these patterns and outcomes look over the past generation. I’m curious to see how stable these relationships and findings are moving forward. Does moving to these same places today produce the same results in 20 years? Third, there is so much more in the research, but I would be remiss if I did not also point out the great report City Observatory did earlier this year on diverse, mixed-income neighborhoods, including lots of maps as well. I found this article and the full report very interesting. One of the things I thought about while reading was the top areas for mobility from the 1980 Census data were lumber and wood products towns where their schools were paid for from the property taxes those businesses paid. I have my doubts that the same mobility would be found in those areas due to the change in the local economies of those small rural counties. Check out our free subscription service!